WASHINGTON, Jan 5 2013 (IPS) - With President Barack Obama reportedly primed to nominate former Republican Sen. Chuck Hagel to head the Pentagon early next week, the powerful Israel lobby, led by the American Israel Public Affairs Committee (AIPAC), faces a major dilemma. If it mounts a vigorous campaign to fight Hagel’s confirmation by the Senate, it could put at serious risk its relations with the president, who is about to be inaugurated for another four-year term. Worse, if it loses such a campaign, the aura of near-invincibility that it has assiduously cultivated over the past 30 years – and which has translated into virtually unanimous votes on resolutions in both houses of Congress in support of Israeli policies from the Occupied West Bank to Iran – will suffer a serious blow. Yet, if it acquiesces in Hagel’s confirmation, it will result in the placement in a critical foreign policy post of a man who prides himself on his independence. Hagel has expressed strong scepticism about – if not opposition to – war with Iran, and, despite a record of strong support for Israel’s defence needs, has not hesitated to publicly criticise both the Israeli government and its supporters here for pursuing actions that have, in his view, harmed Washington’s strategic interests in the Middle East. That Hagel will indeed be nominated has not been officially confirmed, and two possible alternatives – Deputy Defence Secretary Ashton Carter and former Undersecretary of Defence for Policy Michele Flournoy – have reportedly been fully vetted for the post. Both have served under the Obama and Clinton administrations and are considered accomplished technocrats who, however, lack Hagel’s political experience and stature. But a number of highly placed sources and well-connected journalists have reported over the past 24 hours that the former Nebraska senator, who has co-chaired Obama’s Foreign Intelligence Advisory Board since 2009, remains the president’s preferred candidate despite a furious three-week campaign led by neo-conservatives, such as Weekly Standard editor William Kristol Washington Post blogger Jennifer Rubin, the Wall Street Journal’s editorial page, and the Republican Jewish Coalition (RJC), to pre-empt his nomination. Among other charges, Kristol, who also heads the far-right Emergency Committee for Israel (ECI), Rubin, and other foes have accused Hagel, a highly decorated Vietnam War veteran, with anti-Semitism and hostility toward the Jewish state. They have also tried to enlist – with some initial success that has subsequently dissipated – the gay community in their campaign by citing, among other things, his scepticism over easing the prohibition of gay enlistment in the military and his opposition to the nomination of an openly gay ambassador in the 1990s. Hagel subsequently apologised, and both the ambassador and most LGBT organisations have accepted his apology. While the neo-conservatives, whose political views are close to those of the ruling Likud Party and, in some cases, the settler movement, have led the anti-Hagel drive, the involvement of the more-cautious Israel lobby – which includes AIPAC and other major national Jewish organisations, such as the Anti-Defamation League (ADL) and the American Jewish Committee (AJC) – not to mention numerous Christian Zionist groups, such as Christians United for Israel (CUFI) – has been more discreet. Early on, the long-time head of the ADL, Abraham Foxman, for example, called Hagel’s views on Israel “disturbing” but said his group would not necessarily oppose the nomination. AIPAC itself has not commented on Hagel, although its former spokesman, Josh Block, who now heads The Israel Project (TIP) but remains close to AIPAC, has been among the most active participants in the campaign. Despite also enlisting the support of the Washington Post’s editorial page, which also expressed concern over Hagel’s generally non-interventionist positions and support for cutting the defence budget, the no-holds-barred nature of the neo-conservative campaign has spurred a backlash. It is particularly visible among Republicans who hail from the more-moderate, internationalist wing of the party most closely identified with Dwight Eisenhower and George H.W. Bush. There is also resistance from retired senior military, intelligence, and foreign service officers who share a “realist” foreign policy perspective and oppose the kind of adventurism favoured by neo-conservatives, including Kristol, who led the charge into Iraq 10 years ago and are now beating the drums for war with Iran. For example, four former national security advisers, including Brent Scowcroft (Gerald Ford, Ronald Reagan), Zbigniew Brzezinski (Jimmy Carter), Gen. James Jones (Obama), and a former Reagan defence secretary, Frank Carlucci, as well as several former chiefs of the U.S. Central Command (CentCom) have signed letters in support of Hagel. Many observers close to the Pentagon believe that Hagel’s views, particularly regarding the folly of attacking Iran and the damage inflicted by Israel’s continued occupation of Palestinian lands on Washington’s strategic position in the Middle East, reflect those of much of the serving military brass. Four former U.S. ambassadors to Israel have also backed his nomination, as has most recently Ryan Crocker, who was widely praised by neo-conservatives during his tenure as ambassador to Iraq and Afghanistan and who has also served as Washington’s top envoy to Lebanon, Kuwait, Syria, and Pakistan. The sharpness of the neo-conservative campaign – particularly its allegations that Hagel is anti-Semitic and anti-Israel – has evoked charges of McCarthyism from his defenders, adding to the discomfort of the Israel lobby’s main organisations. Even CUFI, sometimes described as more Zionist than the Jewish organisations, disassociated itself from some of the charges. Thus far, only three Republican senators have said they will oppose Hagel if he is nominated, while several others who have traditionally been close to the lobby, including Sens. John McCain and Lindsay Graham, have voiced strong reservations but refrained from committing themselves. Some Democrats have also quietly expressed concern. But most observers believe that, if nominated, Hagel, who also heads the influential Atlantic Council think tank, will be confirmed by a solid – if not overwhelming – majority of senators. That makes the lobby’s position even more delicate. During his two terms as senator, Hagel, a consistent conservative on social and domestic issues, was personally popular with his colleagues on both sides of the aisle. AIPAC and like-minded groups will no doubt be influenced by the views of Israeli Prime Minister Benjamin Netanyahu, whose right-wing coalition is favoured to win elections later this month. The major U.S. Jewish organisations and AIPAC have historically given great weight to the policy preferences of Israel’s elected leadership, even as they have privately urged them to take a different course. But for Netanyahu, who has been sharply criticised by retired senior officials of Israel’s national-security establishment for allegedly endangering the Jewish state’s strategic ties with the U.S. by repeatedly defying Obama, the stakes are also high. If he is seen as backing any effort to defeat Hagel’s anticipated nomination, his ties with the White House – already tenuous given his scarcely veiled support for Mitt Romney in the November presidential campaign – will likely only worsen. who will dare to challenge the Shadow Government ? 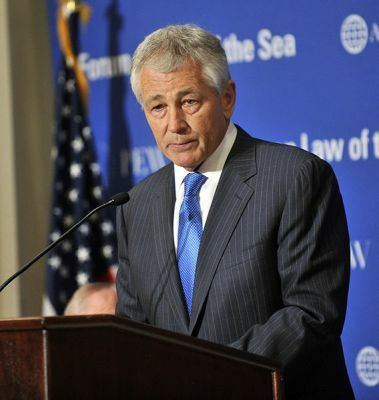 Chuck Hagel, like Ron Paul, will provide fake, distracting, opposition.